Marijuana readily crosses from mother to placenta and umbilical cord, and into the fetal circulation and tissues. Research shows that the major effect is on the development and maturation of the fetal brain, which can have long-term consequences. An early study of pregnant monkeys and their fetuses, reported in Toxicology and Applied Sciences: THC injected in the mother rapidly crossed the placenta and cord, and peak levels were found in fetal blood in 15 minutes. THC was also found fetal tissues, including brain and liver, three hours after the mother's dose. Another early study in pregnant rats reported in Life Sciences: THC delivered to the mother's stomach readily crossed the placenta, and 10% of the dose was found in fetal blood. Another aspect to consider is that after crossing the placenta and umbilical, marijuana compounds may hang around in fetal tissues and continue to exert an effect on the brain for weeks. According to a 2008 review in the Annales Pharmaceutiques Francaises, THC compounds are stored in fat so that even after a single exposure to marijuana, they can remain in the body for weeks, even though they may no longer be detectable in the blood. The research on the the effects of in-utero exposure of marijuana on an offspring is complex and not yet well understood. According to a 2009 review in the European Archives of Psychiatry and Clinical Neuroscience, there is evidence that exposed human babies behave and respond differently to stimuli and are more likely to have developmental, learning, and behavioral difficulities throughout life. THC's effects may not be apparent until months or years after birth. Experts note that, unlike other effects of marijuana on the brain, changes in behavior and function are not easy to study in humans because of the influence of multiple other factors, including genetics and environment, on human behavior. A review of studies in rats, published in Psychopharmacology in 2011, notes that exposure to even small amounts of cannabinoid compounds in pregnancy appear to have long-term effects on reactivity, behavior, and cognitive abilities on offspring, and increases the risk for drug abuse later in life. Researchers conclude that the effects seen in human offsprings may vary depending on the source of the marijuana, the dose and frequency of use, and when in pregnancy the exposure occurred. According to the National Institute on Drug Abuse, THC exerts its effects on a baby's brain through his endocannabinoid system. This system is present in the brain of the early fetus and therefore it is vulnerable to THC's actions when it binds to cannabinoid receptors. The system appears to be involved in brain maturation, especially in the control of learning, emotions, and behavior. 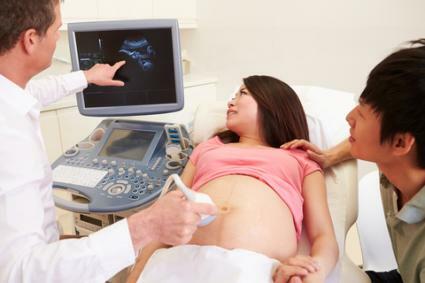 One study reported in Obstetrics and Gynecology in 2014 found that there might be an increased risk of fetal loss at 20 weeks. According to the American Congress of Obtetricians and Gynecologists (ACOG), marijuana is the most common illicit substance used during pregnancy because many women may believe that it is safe to do so. In a July 2015 Commitee Opinion, ACOG advises against the use of marijuana during pregnancy because of the studies showing adverse effects on a baby. ACOG also warns against marijuana use during breast feeding because THC is also secreted in breast milk and could affect a breast-fed infant. In addition, they do not support the use of marijuana for medicinal purposes during pregnancy. Marijuana crosses the placenta and the umbilical cord efficiently to the fetus. It has detrimental effects on the developing brain of a baby that may affect his behavior and learning all his life. Take expert advice and stay off marijuana at least one month before pregnancy, and during pregnancy and breastfeeding.